From Scott Martin, Mountain Chalet Blogger. December 24, 2016. It’s Christmas Eve and some might say it’s no longer early season while others might say it’s definitely early season. Who cares? Let’s take a look at conditions around the four mountains. We were still playing golf in mid-November … in shorts … looking up at Buttermilk and Highlands and noticing the noticeable lack of snow, especially lower down. It was that warm. The colder temperatures arrived toward the end of November but too late to open anything on Thanksgiving Day. Fortunately, we’ve had some serious snowfalls since then and conditions are pretty good overall. 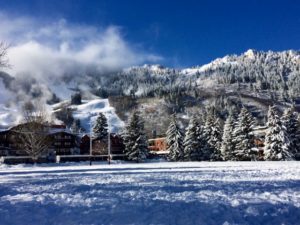 Shot from the knee deep snow toward our Aspen hotel after the major storm in mid-December. Up top, the mountain is in great shape with the cruisers benefiting from the latest big storm about a week ago. The bumps are getting bigger. Runs on Bell Mountain and Gents Ridge could use some more snow but are plenty fun. 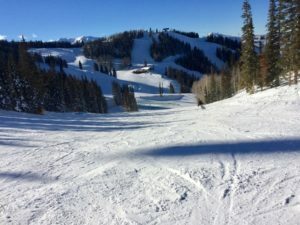 It was a little hairy getting down Copper and Little Nell but the Ruthie’s side and Lift 1A are not open so there’s a way to avoid the sketchy parts. Up on Deer Park looking toward Ruthie’s. Pretty much everything is open at Highlands with great coverage top to bottom. The Bowl is open. The snow has been a little “squeaky” but that’s being picky. 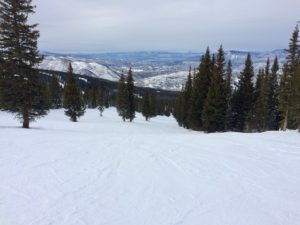 It took a while but, again, pretty much everything is open at Snowmass. You won’t be alone … there are plenty of vacationers cruising around. Looking down Gunners View at Elk Camp. Notice the hordes. I haven’t been there yet but, from the bus going to Snowmass, it looks good, especially over toward Tiehack. Over the next two weeks, I’ll have some updates.